As energy prices continue to climb it is even more important to get your heating system running as efficiently as possible. Whether you have an old furnace you want to replace for a higher efficiency version, you need your vents cleaned and their seals checked, or you want to upgrade your thermostat to allow for a more regulated heating, Desert Air Conditioning Inc is the heating contractor Palm Springs trusts. Got a furnace or boiler that is more than 15 years old? Got a heat pump that is more than 12 years old? The US Environmental Protection Agency recommends upgrading your heating system when they hit these points. New models are made to utilize less fuel and/or electricity, making them more cost-effective and environmentally sound. Having served as the premiere heating contractors in Palm Springs and surrounding areas for over 60 years, Desert Air Conditioning has built a reputation for quality. Our experienced, licensed HVAC contractors know how to repair and install any heating system out there. Our warehouse stocks as many parts as possible so we don’t have to keep you waiting for an order to arrive. We make same-day repairs, so you don’t need to be left in the cold when those winter temperatures drop. 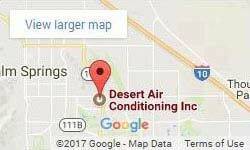 At Desert Air Conditioning we earn our excellent reputation one heating repair and heating installation at a time. We take time to go over options with you when you are ready to upgrade. Our heating contractors know all the ins and outs of each brand and style of heating system and are happy to listen to your needs and your budget and make suggestions as to the best available options for you. We understand the investment that installing a new heating system can be. That is why we do everything we can to help keep costs low. We look for heating systems with the best consumer quality ratings, lowest energy costs, and longest warranties. When you call Desert Air Conditioning you have come to a heating contractors who are looking out for your interests. All our prices are upfront and we do not do any work without your approval first. Not only do our contractors do a stellar job at repairing heating systems and heating system installations, we also stick around to make sure you understand how everything works. We train people to use thier new thermostat and can offer tips on the best ways to use your heating system. We also offer regular maintenance to make sure your heating system stays in good working and efficient condition. Call Desert Air Conditioning today for a heating contractor in Palm Springs you can trust.